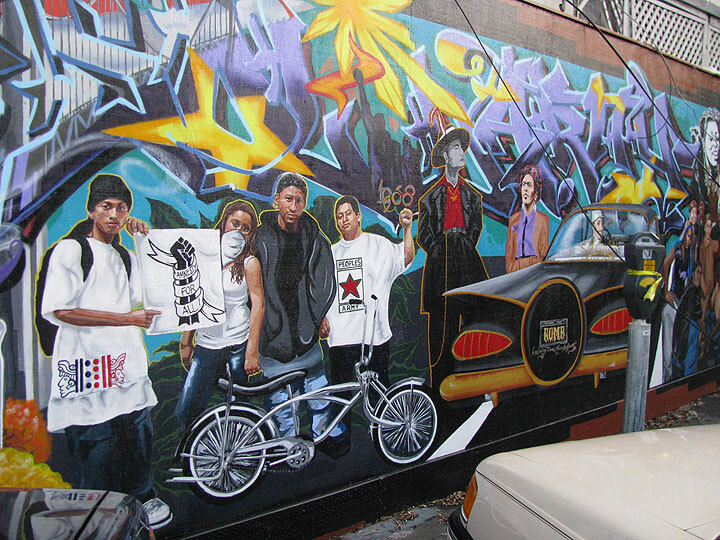 Craftily melding urban motifs, the mural celebrates [Latino youth]’s bicultural realities: lowriders cruise alongside hyphy “scrapers,” pachucos and Mac Dre mingle, and graffiti lettering makes the same statement as silk-screened Brown Pride posters of the 1970s. 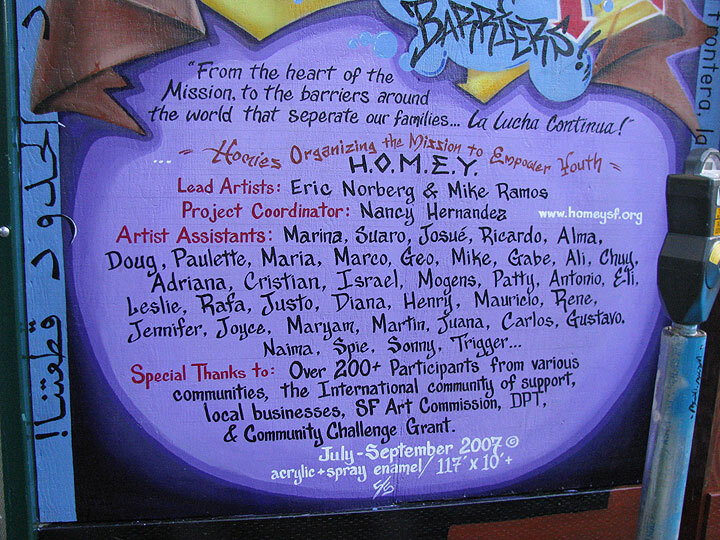 The work was created from July to September, 2007 by members of Organizing the Mission to Empower Youth, a neighborhood-based youth leadership nonprofit serving at-risk Latino teens and young adults. 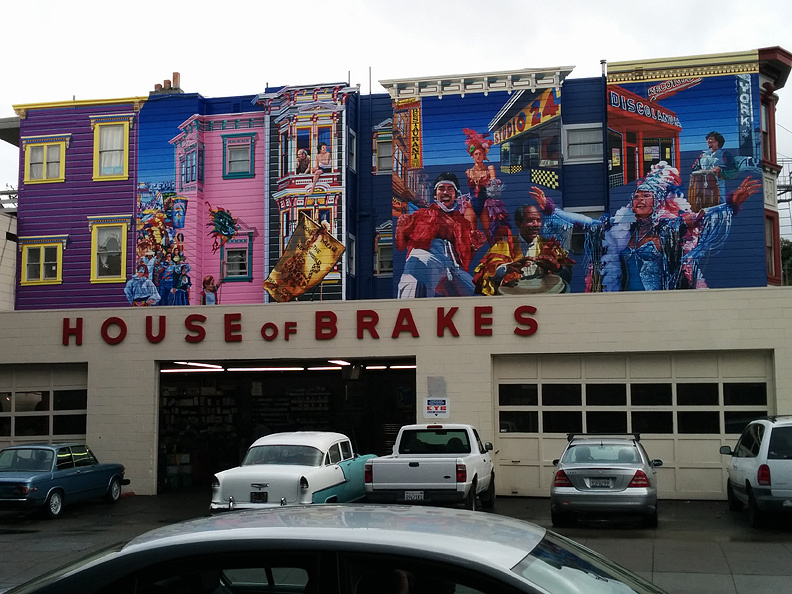 The primary goal of HOMEY is violence prevention. 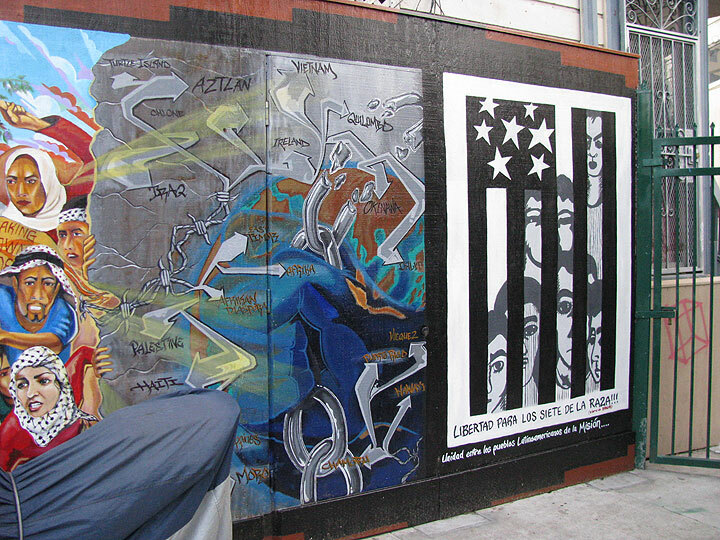 Through art, education, and skill-building activities, the organization offers alternatives to young people growing up in a rough environment where gangbanging, drug dealing, gun violence, and incarceration are the norm. . . 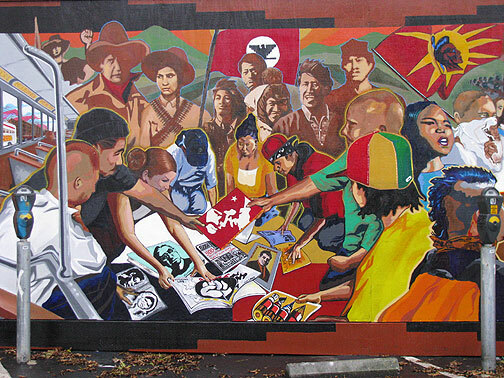 Although a core group of teen and adult artists executed the initial planning and design for the mural, in the end more than 200 community members contributed to the painting. 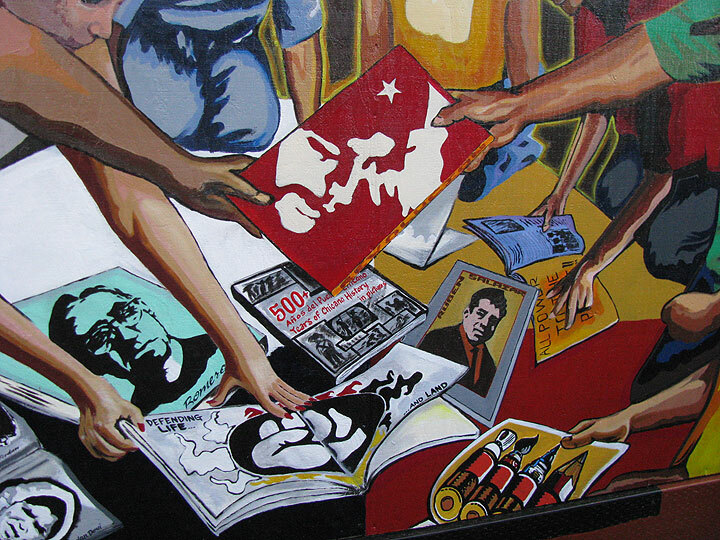 The title of the piece is Solidarity: Breaking Down Barriers. 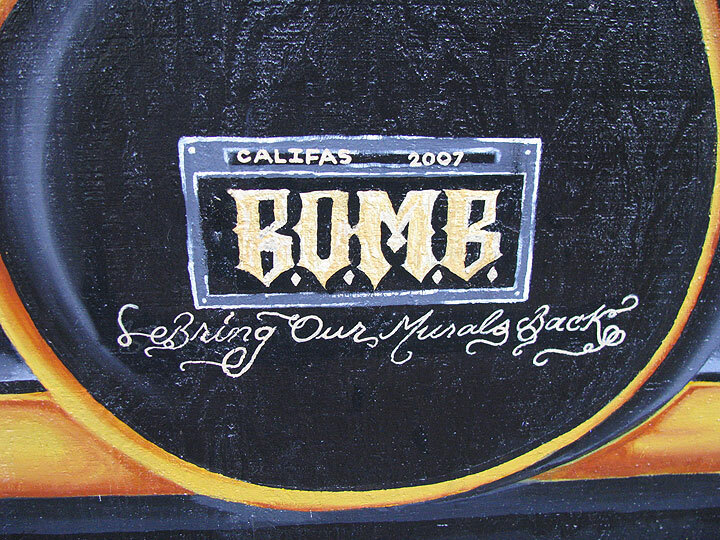 Taking unity as a starting point, the artists began by brainstorming about the influences that divide people, communities, and cultures: everything from national boundaries to gang-affiliated colors. No national flags appear in the 100-foot-long painting. 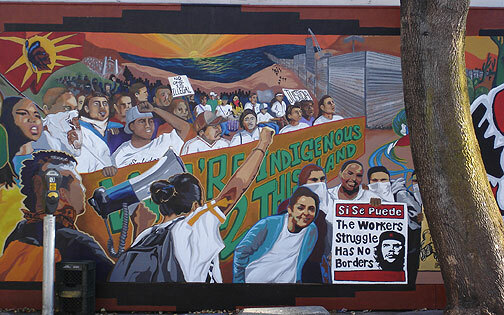 The United States-Mexico border wall figures prominently, snaking through the background of the mural’s central panels, but it’s juxtaposed with portrayals of intra-and inter-ethnic alliance in the foreground. 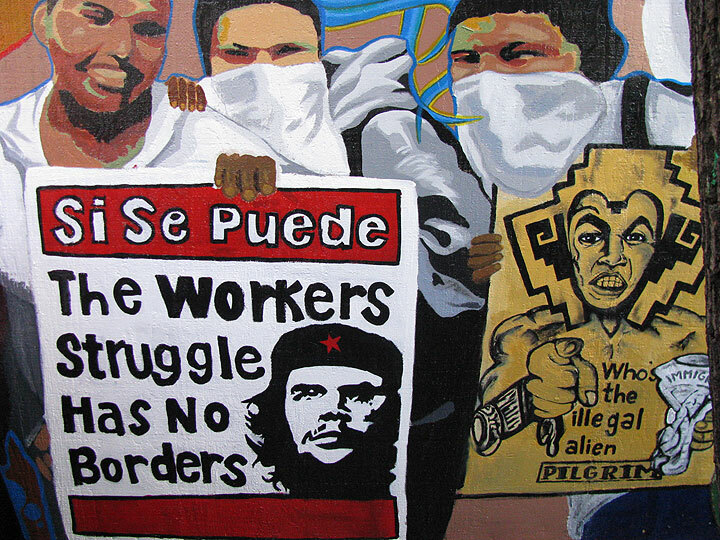 Mexican Revolucionarios, members of the United Farm Workers, and Brown Berets, all painted in sepia tones, float beneficently behind modern-day Raza activists wearing white tees and white bandanas—a purposefully neutral color warn nationwide by Latino youths during the immigrant rights rallies of May 1, 2006. 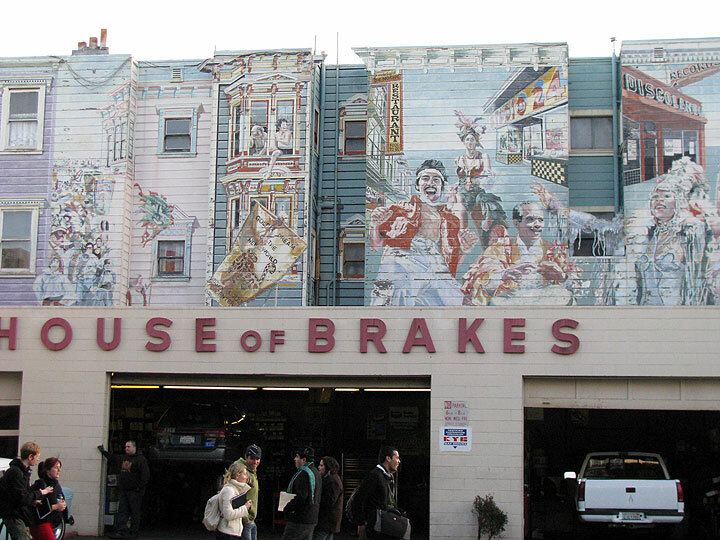 In the Bay Area, many of those activists were HOMEY members. As celebratory as the painting is, one controversial panel on its far right-hand side threatened to overshadow the entire project. It’s a portrayal of the Palestinians garbed in traditional Arab kaffiyeh head scarves breaking through a concrete wall—ostensibly the Israeli West Bank security barrier. the image fits into a third-world rights vignette expressing solidarity with indigenous groups and colonized peoples. 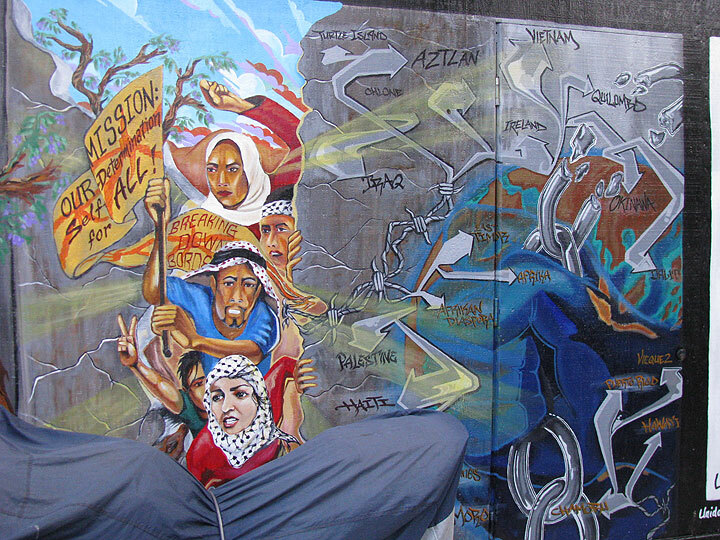 To many, it may come as a surprise that the mural’s Palestinian imagery was so controversial. 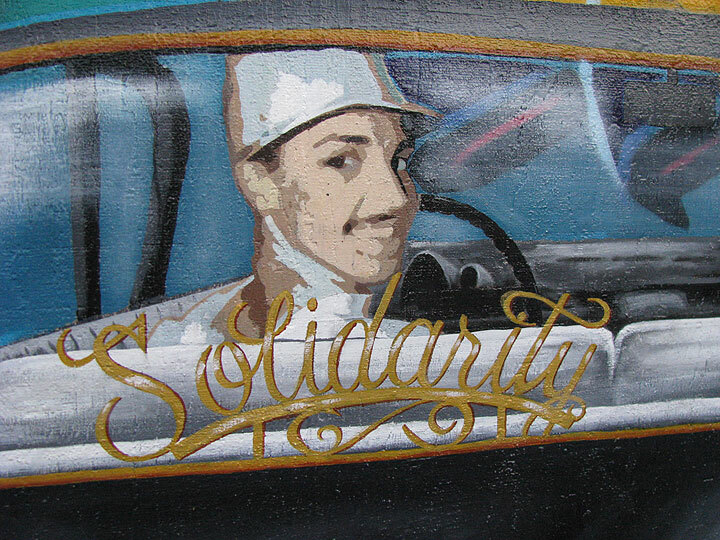 After all, claiming solidarity the Palestine is a common stance among San Francisco’s radical left. 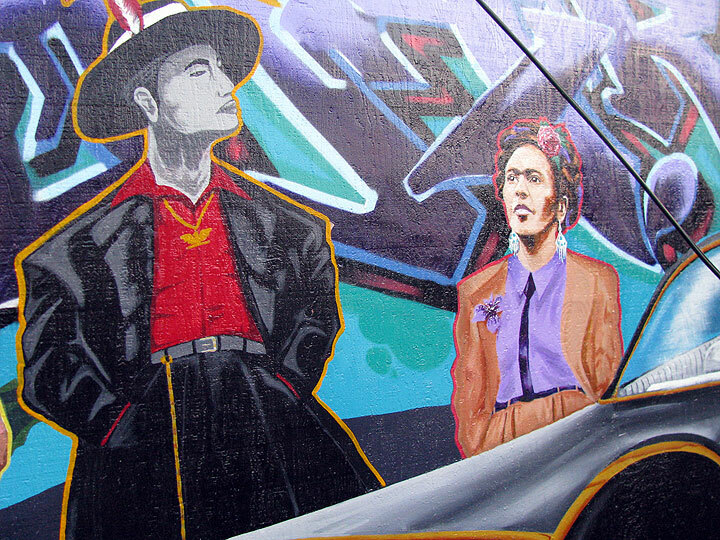 Nonetheless, by giving their input, the mural’s detractors wound up being collaborators on a project authored by, as it turned out, truly disparate voices in the community.